It’s hard to believe that I lived in Switzerland for over a year without once visiting Germany. In fact, before this weekend I’d never been to Germany at all — unless you count catching flight connections in some of its airports. So I took a first step towards rectifying my relationship with Switzerland’s neighbour to the north by visiting Freiburg this weekend. 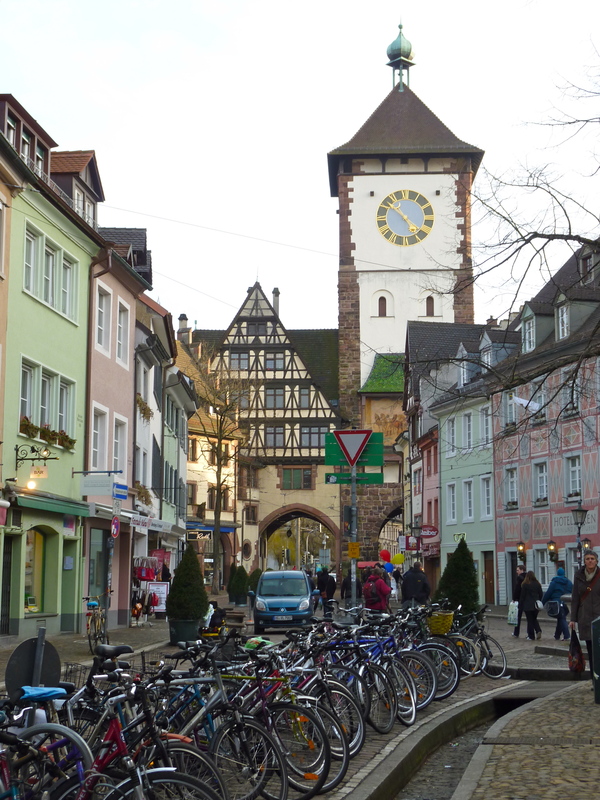 Freiburg is a South-German university town with some 220,000 residents. It registers on the radar of a fair number of Euro-travellers because of its position in the Schwarzwald, or Black Forest (yes, this is where both the ham and cake originate). We went there in order to celebrate the birthday of a colleague and friend of Stelian’s. It was an easy less-than-two-hours train ride from Zurich, but in certain respects it felt as though we were a world away — it was amusing to watch our Swiss travel companions lapse into Swiss German and receive strange looks from the locals, and it was nice to spend an evening eating good food and ordering several rounds of drinks, only to be presented with what seemed a laughably small bill at the end of it. On top of all this, this weekend was Fasnacht time again, so were were treated to music, parades and interesting costumes as we wandered the streets, and I now feel as though I’ve had better exposure to this important regional tradition. Another thing that enchanted me about this city were the tile-decorations on the streets – they represented a range of things, from shields to pretty designs and helpful symbols. I think that they must have been put in not so long ago, because in many cases there was concordance between them and the retail space that they were in front of (e.g., an ice-cream cone tile design in front of an ice-cream parlour). This is smart, because Europeans like to own dogs and they often do not like to pick up after them (the problem is especially bad in Paris, I find, though my experiences of actually stepping in what the Parisians call merde de chien have occurred in Amsterdam and Targoviste). Anyway, you must watch your feet while you walk. In Freiburg you must also watch your feet because there is a small canal along the edge of the sidewalk — you can see this in the top photo. So you didn’t necessarily have time to check out all the storefronts, but the street itself would point things out to you — ice cream here! jeweller’s here! and so on. Beautiful photos – sounds like a really interesting stay! Thanks — it was! I’m hoping to check out a bigger German city next.